The giant Buddha statue at Wat Phu Soong. 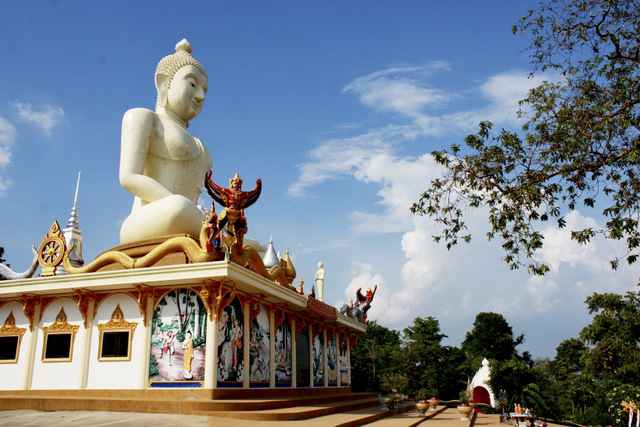 There is a place in Thailand that has a big Buddha statue, stunning views – and no tourists. One disadvantage is it’s rather a long way from Phuket, in Yasothon, a province in Isarn, close to the Mekong River. Wat Phu Soong (Tall Mountain Temple), sits overlooking the rice, sugar cane and arrowroot fields, and Keuan Fai, or Fire reservoir. The nearest village is a good 10 kilometres away. The road up to the wat climbs through old forest, dodging between enormous rocks, some of which had to be hacked away by hand to make room for vehicles. The road emerges onto the top of the mountain and a large expanse of concrete for parking – for certain festivals hundreds of people arrive, so the space is needed. But most of the time the only people at the wat are the half dozen or so monks, along with a handful of people making merit by helping out with ongoing construction, or simply spending a few days in silent contemplation. Unlike the Chinese-style Buddha atop Phuket, the one at Wat Phu Soong is more of a mix of Lanna and Sukhothai styles, with a long nose. Surrounding the Buddha are smaller shrines dedicated to eminent past abbots of Wat Wang Nathip on the plains below, who had the mountaintop temple built as a place of contemplation. Behind the Buddha, the hill climbs before dropping abruptly – a couple of hundred feet pretty much straight down – and beyond are views that any property developer would give his right arm for. More wonders await. In the rock are curious holes, anywhere from 50cm to a couple of metres across, perfectly circular and going down, in some cases, as much as three metres. The biggest of these are near the carp pool, downhill from the crest of the ridge. They’re potholes, formed by the circular scouring action of river-borne gravel and pebbles over the millennia. Looking around, one realises that the bare rock leading to the pool was once a riverbed. The potholes were created millions of years ago, long before some geological upheaval pushing the ground up into the sky. The pool itself contains some sculptural oddities – half a dozen Kinnaree, the half-human, half-bird beings of Buddhist and Hindu mythology. The sculptor, for some reason, decided to attach their wings at the hips rather than the shoulders, evoking comic images of them flying with their bottoms in the air. More mythology awaits below, down several flights of stone steps. What appeared from above to be a vertical cliff is more than that. The top of the hill is in fact a hefty overhang. Below, cells have been built for quiet contemplation, along with a giant image of a Reusi, a hermit sage. The rocks under the overhang are decorated with bas-reliefs of scenes from the life of the Buddha, created by a stonemason from Kalasin. All of this can be contemplated in peace and calm, with only birdcalls and the buzz of insects to interrupt the silence. To get to Wat Phu Soong, head out of Amnat Charoen Town, heading north on route 212. After about 35 km look out for signs to Bung Kha. When you reach there, ask for directions. As you get closer you will see the Buddha standing tall above the trees on the top of the mountain, the only one in the area.